I have been staying in the USA since July 2016 on H4 visa. My husband is on H1B. I want my parents and my sister to visit us for a pleasure trip during the month of July/August-September, 2019. Last year (in August 2018) my parents and my sister applied for B2 visa together from Kolkata location. My parents’ visa got approved but my sister’s visa got rejected. They gave 214(b) for her as reasons. We want to apply for her B2 visa again and I have some questions regarding that. My sister’s age is 22. She is an engineer, passed out in 2018. Last year in August when she applied for the visa she used to work in a small company as a content writer and her salary was 13k per month. She joined the company in July and she went for the visa interview in August. That job was a contractual based job. The contract got over in September and after that my sister joined in Amazon India on 31st December, 2019 as a seller support associate. Now her salary is 2.9 lac per annum. She is now posted in Hyderabad. 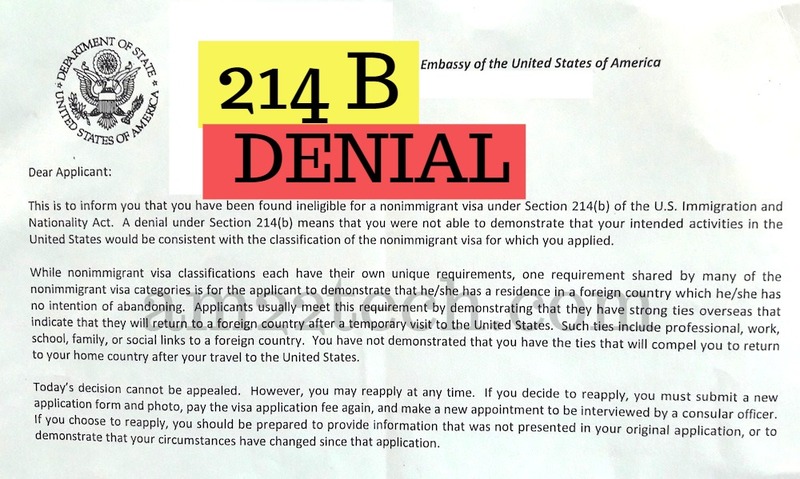 Is there any chance of her B2 visa approval after rejection last year? Is it worth it taking another chance? Even if we are reapplying, since she is now posted in Hyderabad, which location should she apply from? Hyderabad or her home town Kolkata? I have heard from many people that it is always better to apply from one’s home town, otherwise there is more chance of denial. How much truth is there about this? The B1/B2 approval after 214B rejection are low if the circumstances have not changed a lot for your sister. The visa officer was certainly not convinced that she will return to India once she visits USA due to her age. I can understand your concern but it is really difficult to convince visa officer as your sister is still un-married and does not really have strong ties with India at this time. It is your choice to choose home town US embassy or work town. Thanks a lot Anil. I have couple of questions more. I guess the visa officer will have all the information that last time my sister applied for B2 along with my parents and their visa got approved and hers got denied. What do you suggest to tell the visa officer? Should my sister mention this time that my parents have already got the visa, they just could not go because of her rejection and this time if her visa gets approved, three of them will visit together to my place? Or she shouldn’t even mention about my parents? Last time it was shown that my father is sponsoring the trip. This time can it be shown that my husband is sponsoring? Can the question come that how can my husband sponsor the trip since it was shown last time that my father is sponsoring? Will they consider this as a discrepancy? Or it doesn’t matter who is sponsoring? You should answer only the questions that visa officer asks. Do not say anything that visa officer has not asked for. It does not matter if your sister is to going to travel with parents or not. The main thing is about her ‘intent’ that she has to prove that she will come back to India. Anybody can sponsor your sister now. It does not matter who sponsored her last time. Thank you Anil. I appreciate your response. May be we will try our luck one more time. Let’s see what happens. I 'm not a legal expert but I do know of a 23 year year old single female who got approved for her visitor visa. What worked in her favor was that although she did mention relatives in her DS160 her sponsorship was “self” because she was earning well. She had also traveled abroad to 2 other countries prior to her interview.